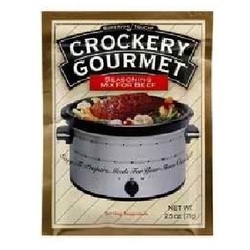 Our Crockery Gourmet Seasoning Mixes are easy to prepare meals for your slow cooker. The recipes on the package show just how easy they are, just add the contents of the packages to vegetables, water, the appropriate meat, and let cook all day. The results, a delicious meal with thick savory sauce.